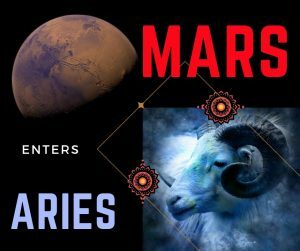 Mars will enter its home sign of Aries just as the New Year kicks in. Giving us all a hands-on, get-out-there-and-do-it start to the year, the planet will leave Aries for Taurus on the 14th February. In the natal theme Mars represents our basic drive, our energy, the way we act thus our assertiveness and our anger. We experience our first Mars return at age 2 years and this is when we learn to assert ourselves by saying “NO” to everything and everyone. It is at this age that we learn how to control our Mars function or not if no-one is there to direct our assertiveness into the right channels. If for some reason we are unable to learn how to positively express our Mars energy, especially anger, then we could experience angry people and situations showing up in our lives with us being the victim or, Mar’s energy could take over completely. 18/01 trine Venus at 11°45’….a little bit of passion could go a long way! 21/01 square Saturn at 13°47’….a road block or steady progress? 22/01 trine Jupiter at 16°02’….energy to sell or a feeling of omnipotence? 02/02 square Pluto at 21°40’….unconditional power given or taken? Since Mars transits rarely go unnoticed in a chart, are any of you willing to write down and keep track of what happens to you during this period (and even tell us about it afterwards)? Certainly Mars will not only be travelling through a certain house in your natal chart but he will almost certainly be making some major aspects (conjunction in Aries), opposition (in Libra), square (signs of Cancer and Capricorn), trine (signs of Leo and Sagittarius) to other planets and angles in your chart on his journey. Worthy of keeping an eye on, also the house cusps ruled by Mars in your chart (the signs of Aries and Scorpio). It would be interesting to see how this transit affects each of us and this is also an excellent way to better understand the workings of the planet in our real and everyday life. Once the transit is over would any of you be willing to share their experiences?